PARIS, France, December 8, 2015 (ENS) – An unprecedented coalition of the world’s major financial institutions met on the sidelines of the United Nations COP21 climate talks in Paris Monday and agreed to adopt five Principles to Mainstream Climate Action. With more than US$11 trillion, 26 public and private financial institutions, from both developing and developed countries, voluntarily adopted these principles to combat climate change. “Closer cooperation outlined by the new principles is essential for strengthening our combined efforts to combat climate change,” Taylor said. 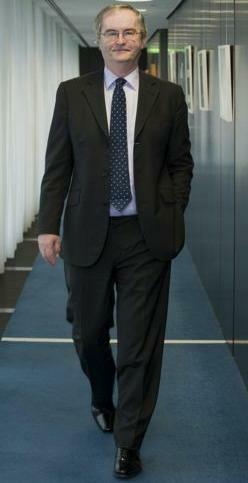 “This new initiative reflects the EU Bank’s own commitment to enhance the impact of climate action and follows the EIB’s climate lending strategy adopted earlier this year that ensures that climate action will be part of everything we do,” he said. The Principles outline how financial institutions can: commit to climate strategies, manage climate risks, promote climate-smart objectives, improve climate performance, and account for climate action. A related publication, also released Monday, compiles emerging practices of financial institutions as they integrate climate change considerations into their core activities. Separately, the International Development Finance Club, IDFC, a group of 23 international, national and subregional development banks from across the world has cooperatively published their annual green finance mapping report for the fourth year. Stock exchange chief executives also came together in Paris to discuss how stock exchanges, investors and regulators can support the global climate agenda. The gathering of CEOs began with a special opening bell ceremony Monday at Euronext Paris dedicated to the success of COP21. Euronext is one of 11 stock exchanges that showed their commitment to sustainable capital markets, and their support for the evolving climate agenda, by becoming a United Nations Sustainable Stock Exchanges (SSE) Partner Exchange. 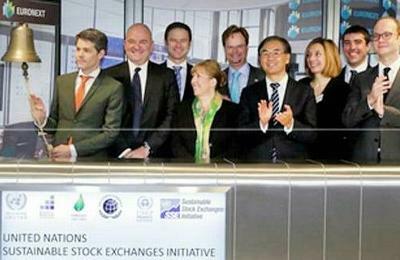 The SSE initiative now has participation from some 47 stock exchanges on five continents, including four out of the top five largest exchanges in the world. Addressing the stock exchange CEOs at a luncheon, economist Jeffrey Sachs, director of Columbia University’s Earth Institute encouraged capital market leaders to act boldly on climate, and congratulated them for work already done. Unprecedented corporate engagement on key climate issues that include carbon pricing were announced Tuesday at the Caring for Climate (C4C) Business Forum, a parallel event timed to coincide with COP21. The UN Global Compact, UN Environment Programme and the secretariat of UN Framework Convention on Climate Change, UNFCCC, came together under the banner of Caring for Climate – the world’s largest business coalition for climate change. More than 700 participants from business, finance, government, civil society and the United Nations gathered to discuss the private sector’s role in the world’s new climate agenda. 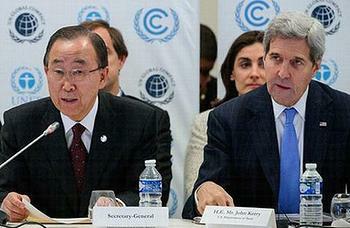 The event was attended by UN Secretary-General Ban Ki-moon; France’s Minister of Environment, Sustainable Development and Energy Ségolène Royal; and U.S. Secretary of State John Kerry. Many new pledges emerged from the Caring for Climate event. Some 65 CEOs with a total market capitalization of US$1.9 trillion across 20 sectors have integrated carbon pricing into corporate long-term strategies and investment decisions. They pledged to set an internal carbon price, report publicly, and call for carbon markets through the Business Leadership Criteria on Carbon Pricing. There were the 79 chief executives, representing US$2.13 trillion in revenue who announced that their companies would reduce their environmental and carbon footprints, set targets to reduce their emissions, and collaborate with supply chains and across sectors. In addition, 140 companies with a total market capitalization of over US$100 billion and nearly 30 institutional investment firms with assets estimated at US$2.5 trillion committed to including climate change-related information in their mainstream reports. Kerry highlighted the support of more than 150 U.S. companies for action on climate change through their commitment to the American Business Act on Climate Pledge.